Manchester United jumped back into the top four after making it six away wins on the spin at Fulham on Saturday afternoon at Craven Cottage, as Paul Pogba stole the show. Despite the 0-3 scoreline, the game lacked intensity from both sides. However, for United, they'll be happy at securing another win without having to get out of second gear, and the afforded privilege of resting a few key players ahead of a tough run-in. For Fulham though, relegation will be more of a formality than a fight if the Cottagers don't find several levels above this performance. The game was less than two minutes old when Fulham carved out the first gilt-edged chance of the game from a quick counter-attack. Andre Schurrle led the charge out wide and expertly picked out Luciano Vietto unmarked at the far post, but the forward scuffed a big chance to put some early pressure on the visitors. Things quickly went downhill from their for Claudio Ranieri's side. Pogba continued his run of fine form under Ole Gunnar Solskjaer with a wonderful goal to open the scoring after just 14 minutes. With the angle against him, the Frenchman took advantage of the keeper's positioning in anticipation of a cross, to lash the ball into the back of the net on goal side of the stranded Sergio Rico. Since Ole Gunnar Solskjaer’s first game in charge on Dec 22nd, Paul Pogba has been directly involved in more Premier League goals than any other player. 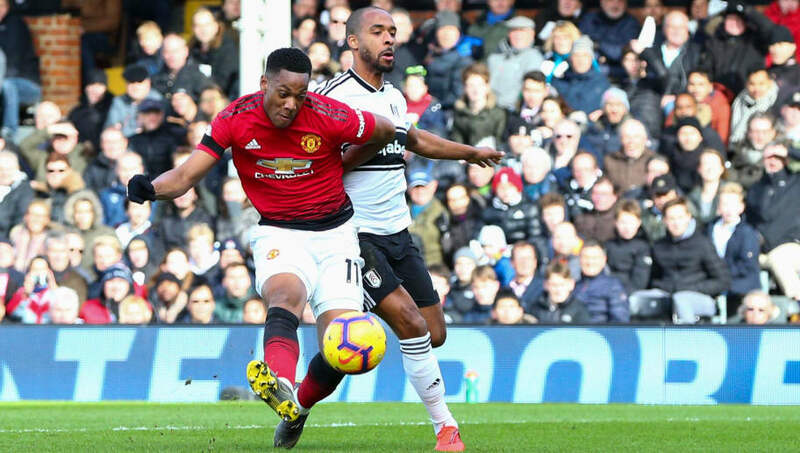 Fulham occasionally looked dangerous going forward, but Anthony Martial sprung a counter-attack of his own to put United in a secure position midway through the first half. Picking up the ball just inside the opposition half, the Frenchman went on a brilliant solo run, beating two defenders before curling the ball past Rico to put Manchester United 2-0 up. Into the second half, Martial continued to create problems for Fulham and was bundled to the ground in the area by Maxime La Marchand on 65 minutes. Pogba stepped up to take the penalty and added some icing to the cake with his second and United's third. Claudio Ranieri had put his faith in a 3-4-3 formation in his early weeks at Fulham but continued defensive troubles have seen them switch back to a back four. The Cottagers started in a more conventional 4-5-1 formation and it yielded positive results in the opening stages. Fulham looked particularly dangerous on the counter-attack, a tactic Ranieri had so much success with at Leicester. Both Vietto and Schurrle squandered big chances early on before a clinical Manchester United showed them how it was done. Conceding their first two shots put another game beyond Fulham and undid that positive start inside 25 minutes, Ranieri may want to consider continuing to add numbers to his backline. That's a league-high 58 goals conceded now and Fulham need to improve that defence because they looked like conceding every time Manchester United came forward. STAR MAN - It's really difficult to pick out a good performance from this Fulham team. It was more like a training exercise than a competitive match at times for United. Poor quality but worse still, poor effort. Ranieris smirk when Babel missed says it all, he is not the man to take us forward. Credit Andre Schurrle for a sparkling first 10 minutes in which he created Fulham's best chance of the game. The German did little else of note before he was removed in the second half but that one moment of quality was more than any of his teammates managed. WORST PERFORMER - Defence is a big problem for Fulham that much is already obvious but it was still of a woeful effort by those standards. United didn't really play with great fluidity and struggled to create much of note but still troubled the Cottagers. Fingers have to be pointed at full-back Denis Odoi, two of the goals come down his side and he's nowhere near any of them. Le Marchand also makes a mess of things but he at least has the excuse of covering for Odoi. It may have been poor opposition and a far from vintage display from Manchester United, but the Solskjaer effect continues to take hold with key players loving life under the Norweigan. Pogba and Martial were the two beneficiaries of that positivity today and made the difference for their side. A lot was made about the absence of Jesse Lingard and Marcus Rashford in the build-up but Solskjaer's magic formula clearly has influence over any number of his attacking options and they've got the quality to finish very strongly this season. STAR MAN - Pogba may steal the headlines but this performance was all about Anthony Martial. An often overlooked star for United but he proved they made the right decision in tying the Frenchman down to a new long-term contract. A goal, an assist and an all-around top drawer performance. He's had to play second fiddle to the likes of Alexis Sanchez and Rashford but the forward always takes his chances and has an excellent goals-to-games ratio. WORST PERFORMER - It was comfortable for United in the end but Fulham did create plenty of promising positions for themselves. The home side actually had 15 shots but struggled to produce the quality in front of goal. The centre-halves stood strong but the full-backs made it a little too easy for the Cottagers. Diogo Dalot hasn't had a lot of game time this season so he was maybe a bit rusty but he'll have to step up his game for the run ahead. Fulham now consecutive away fixtures with a trip to the London Stadium to face West Ham followed by a crucial tie at fellow strugglers Southampton. Manchester United's unbeaten run will really be put to the test in their upcoming fixtures, they face PSG in the Champions League next before a trip to Chelsea in the FA Cup.